Are you in Cambridge/ Boston USA on September 6th? 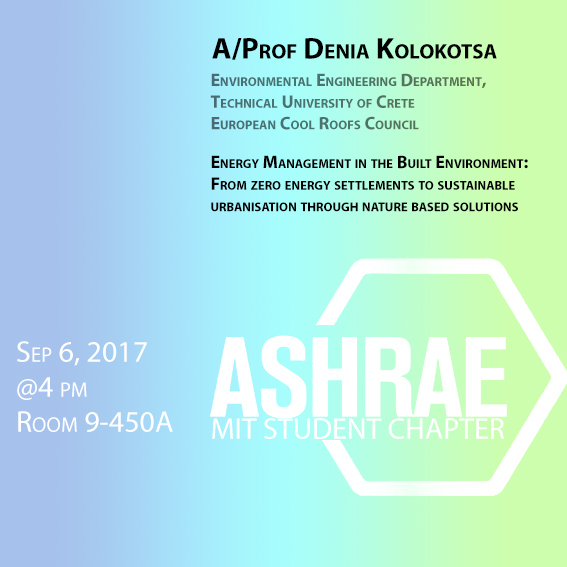 Then, you have the chance to listen to Prof. Denia Kolokotsa discussion about Energy Management in the Built Environment. From Zero energy settlements to sustainable Urbanisation through Nature Based Solutions. Dr. Dionysia (Denia) Kolokotsa received her degree in Physics from the National Kapodestrian University of Athens. She obtained a MSc. degree in Environmental Physics from UOA, a MSc. degree in Architecture-Environmental Design and Engineering from the University College London and her Ph.D. from the Department of Electronics and Computer engineering of the Technical University of Crete. 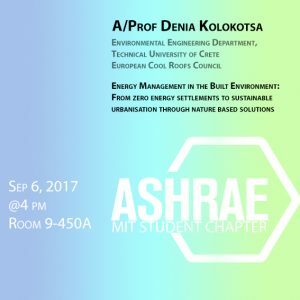 She is currently an assistant professor at the Technical University of Crete, School of Environmental Engineering. Her research interests include energy management and energy efficiency in the built and urban environment, neural networks and fuzzy logic technology, advanced optimization theory and applications, decision support systems in energy modeling and automation. She is the author and co-author of about hundred full papers in international refereed journals, books and conferences. She has participated in more than 25 EU and national projects and has coordinated various international and national projects. She is the author of more than 100 papers published in scientific journals and conference proceedings. She is member of the Advances in Building Energy Research Editorial Board and Guest Editor of the International Journal of Low Carbon Technologies and Sustainable Cities and Society Journal. She is the co-founder and President of the European Cool Roofs Council. Currently, Denia is devoted to lead the ThinkNature project towards success.